COLOR(S):Mixture of gray, black, and cream; the undercoat is pale. They are often wolf gray, with lighter shades on the head and undersides, and with "spectacles" around the eyes. The Keeshond (plural is Keeshunden, pronounced "kayz-hond") is a natural, handsome dog who resembles the spitz of the northern breeds with their richly plumed tail that curls over their back and their thick coat. They are short, sturdy dogs, and have been referred to as the "Overweight Pomeranian" in Victorian England. They are quite furry, with profuse hair and short prick ears. 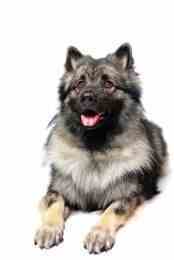 They are the most popular large spitz type breed in England and North America. Their sharp, clear bark make them good watch dogs, but they don\'t have a mean bone in their body and are affectionate and loving companions. They can be stubborn and willful, however. Keeshonds happy dogs, often called the "smiling Dutchman" for their perpetual good-natured grin. They are easy going, independent, and compliant with firm and consistent guidance. Keeshonds are clean animals, relatively low maintenance, and an alert and personable disposition.